When a leading dye plant encountered difficulty in evacuating water from their commercial washing machines, they contacted Assured Automation to recommend a solution. Assured Automation recommended their new 4000 Series Flanged Ball Valve because its full port allows more water to flow, enabling faster water evacuation. They have been able to increase their washing cycles and dramatically improve their productivity. 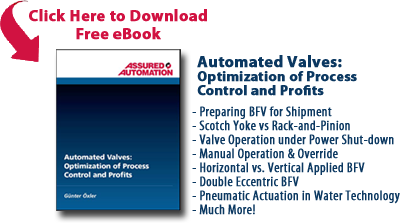 In petroleum applications that require fire safety compliance with API607 4th Edition & ISO 10497, the Assured Automation Flanged Ball Valve is an excellent choice. When fitted with a spring return pneumatic or electric actuator, the 4000 Series Valve provides a fail safe automatic shut off, avoiding manual intervention in dangerous environments. When employing a steam service where the volume of low pressure steam delivery is critical, Assured Automation’s 4000 Series Flanged Ball Valve’s high coefficient enables delivery of high volume steam to a large distribution network typically needed to heat hospitals and college campuses. Utilities also employ the valve in underground distribution in heating and cooling systems. 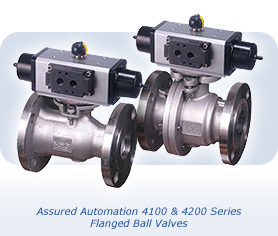 Also the 4000 Series Flanged Ball Valve is the valve of choice in situations where a tight shut-off is required. The quick quarter-turn shut-off and closing can be easily and economically be automated either electronically or pneumatically. This entry was posted in Industrial Laundry/Washing Equipment, Latest News and tagged 4000 Series, Actuated Ball Valves, Ball Valves, Flanged Ball Valves, Full Port Ball Valves, Manual Ball Valves, Stainless Steel Ball Valves, Stainless Steel Valves, Standard Port Ball Valves. Bookmark the permalink.